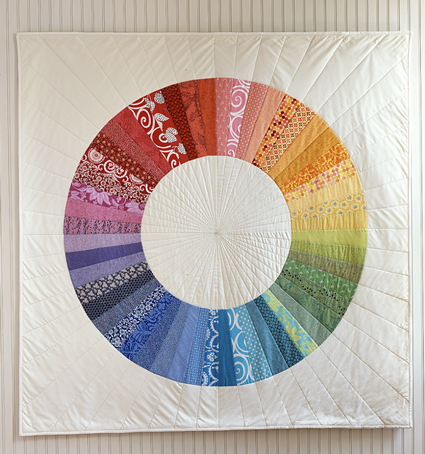 This quilt was originally called the Color Wheel Quilt, but it has come to be known to me as "The Quilt That Fought Me". My son might call this mini "Visual Tension", because it's just a little bit off, and he once told me one of my projects had visual tension because one thing was askew. My original idea for this quilt came from an idea to combine these two quilts from the Purl Bee website. 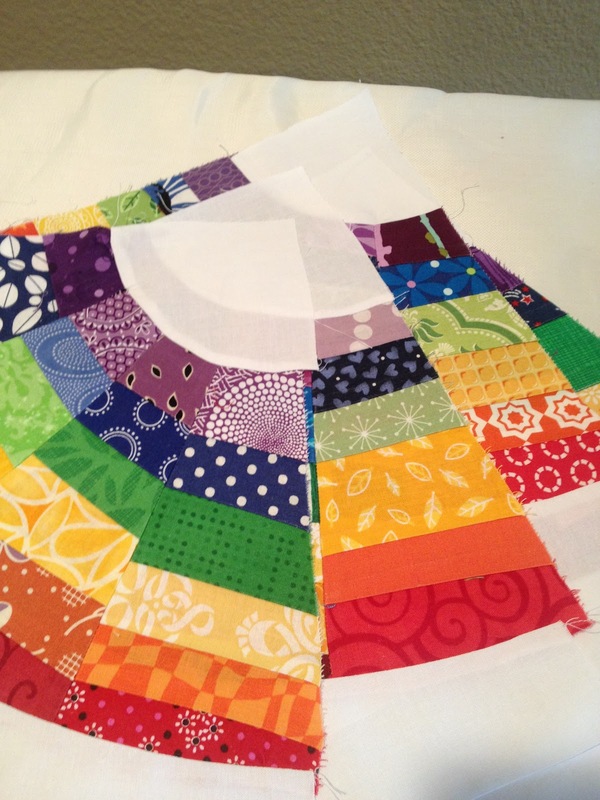 I used lots of rainbow charm squares to paper piece the wedges in this quilt; red, orange, yellow, green, blue and purple. The piecing was a breeze and even sewing the curves was a fun and new experience. I used the curved piecing foot I bought at Road to California a few months ago, which made sewing the wedges to the curves super simple, with no puckers and no pins! So at this point I am feeling pretty good and all I have to do is layer and quilt this mini. That's where the problems started to occur. I first tried to free-motion quilt and did about half the quilt and hated it. So out came the seam ripper. Then I decided to do some concentric circles...another failure andthe seam ripper came out again. Finally, I quilted with a serpentine stitch about one inch apart. It turned out ok and will be a nice reminder of my frustration as it hangs on my sewing studio wall. If it's any consolation (to myself) I really like the IKEA pillowcase fabric I used as the backing and the little safety pins fabric used for the binding. Now I just have to pray the Random Number Generator likes me, because with all the gorgeous entries in this challenge that will be the only way I will have a chance to win one of the fabulous prizes. 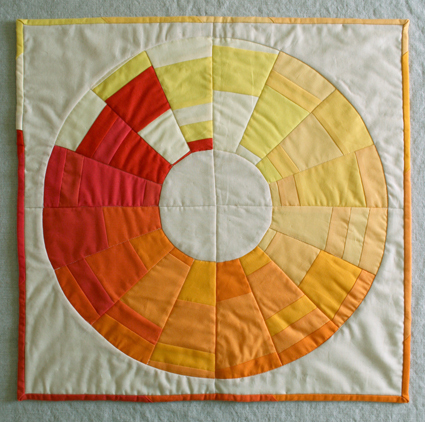 This quilt measures 24 3/4" square. Such a bright and colourful quilt - love the wavy quilting too! I like the way the wavy quilting turned out. that curved foot is interesting - I may be needing that soon! I made this quilt and recently finished but I followed the original design exactly. Yours is wonderful! Very creative and visually rich! I've never heard of a curved foot. I learn so much reading about what other people are doing. Thanks for sharing. I think it's great! What a fun and cheery little quilt! Deciding how to quilt is hard! I think you've chosen a great "pattern." Love it! I have the pattern and it is on my bucket list! Love it, Di - another stunner! 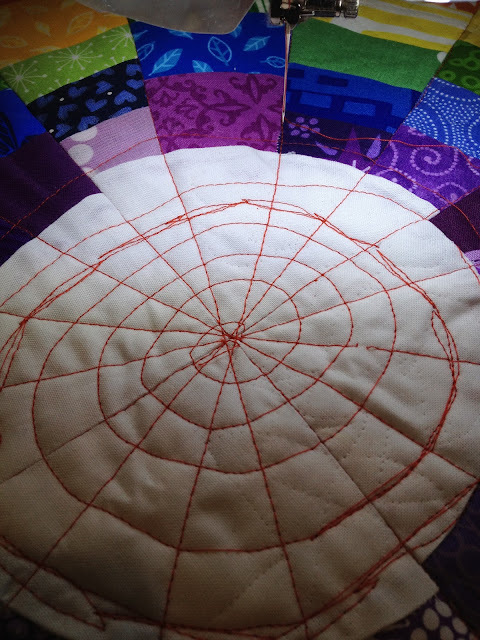 Di, that is a great story and the thing is I love the visual tension in your quilt. I really love most everything about it. Love it, Diane. The quilting really finishes it. And what a good idea, with the Ikea fabric! We have one nearby, so i think I should go soon. It is seriously beautiful Di and you have more than a chance of winning with this, not just by RNG luck. I love it! Despite the issues, it is still a fantastic quilt. Seriously. Ooh don't understimate yourself Di - I think this could be a winner! It's gorgeous!! This is so lovely and gorgeous! I know how frustrating it is to rip out FMQ, I did a lot of that on my last project and I nearly tore my hair out. I'm sorry it was so frustrating! I truly love the quilting you ended with. The wavy lines are wonderful. 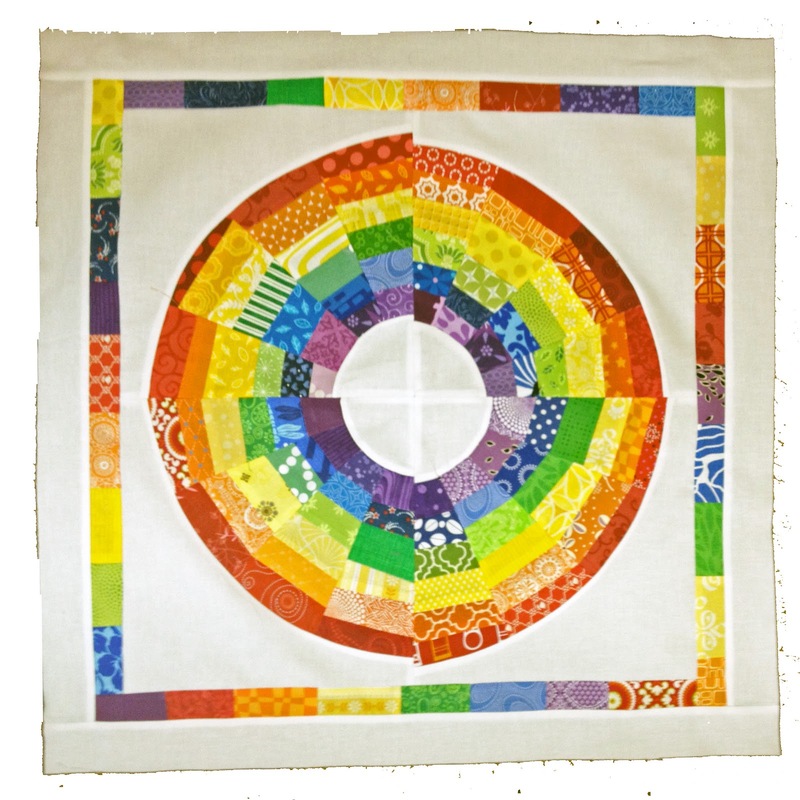 Beautiful bright quilt! Yay for us! We are the random generator winners - how fun is that! Congrats! Your quilt is beautiful!